Most children’s Bible curriculum teach Bible stories for kids by telling the Bible story and crafting a Bible truth into a focused big idea. Big ideas help focus the lesson and create a way for children to memorize (and hopefully take to heart) a simple Bible truth that connects the Bible story to real life. When I learned to write lesson plans for children’s ministry, I learned to give the lesson a focused big idea, but the more I spend time with children and listen to what God is doing in their hearts, the more I wonder if big ideas are really that BIG a deal. Here are three reasons, I am exploring other ways of teaching Bible truths to kids. When we simplify Bible stories for kids into a big idea or a simple application, we may cause children to skip the step where they come to that particular understanding of God on their own. As adults we are so driven to systematize our understanding of God and to communicate that orderliness to children in a neat little package in hopes that easily remembered phrases will carry their faith through life’s ups and downs. But there can be no good systematic theology without a solid Biblical theology. Biblical theology grows much more organically—through story and community and the work of the Holy Spirit over time and through connection to personal experience. Big Ideas or predetermined applications can never fully reach a child in the moment of teaching the way the Holy Spirit is already working. Children do not yet have filters in place that limit their expression or their understanding of God. They even seem to sense His presence and feel their dependence on Him in ways that are often a struggle for adults. Four year old arranges story materials in a purposeful way not immediately meaningful to the adult eye, but it is clear through observation that this child is deeply engaged . Yes, children (and adults) need to make important connection and application of Biblical points to real life, but I wonder if creating those connections for them keeps them from coming up with much more meaningful connections of their own. It’s like in parenting when we try to save our children from failure and struggle thinking we are helping them only to later find out we have created children who do not persist, have a low view of themselves, and do not seem able to accept the responsibilities of adulthood. Could this same principle hold true in spiritual formation? Do we as adults need to think more about holding back our simplified version of truth? Do we need to teach in a way that doesn’t lead to predetermined applications decided by adults who have a predetermined idea of how children should understand God. If so, how do we bridge the space between Biblical understanding and life application without oversimplifying our great God? Big ideas or predetermined applications may not allow the child to share or even realize they have their own spiritual insights. Children should be encouraged to share their spiritual insights in creative and deeply personalized ways. This isn’t the same as using creative teaching methods to teach children. What I am talking about here is providing space and guidance that facilitates their personal discovery, exploration, and expression of the work God is doing in their life. 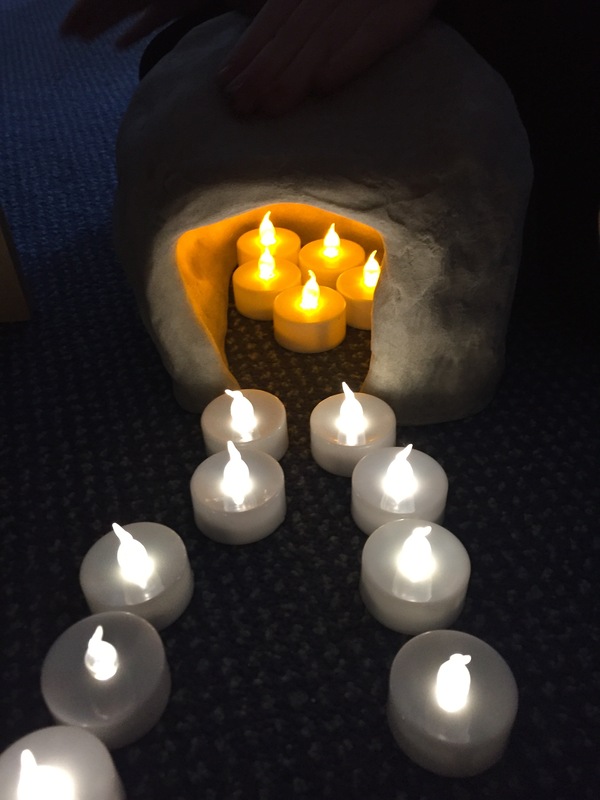 Children place light in Jesus’ tomb. This was spontaneous and a beautiful representation of the connections they are making–even some connections beyond their awareness. The adults who teach Bible stories for kids need to be prepared to listen and guide, recognizing spiritual insight as more than cute kids saying strangely profound things. What a gift we provide for children when we create environments that facilitate the creative expression of God’s power in a child’s life. Allowing them to express God’s already present working can be a very different thing from trying to convince a child of God’s greatness as we understand it. We cannot do the spiritual work of another person. When we try, we rob them of personal experiences of God that form the foundation for relationship as they grow and mature. I wonder what you think? Do Big Ideas in lesson planning help focus learning or can they hinder it? 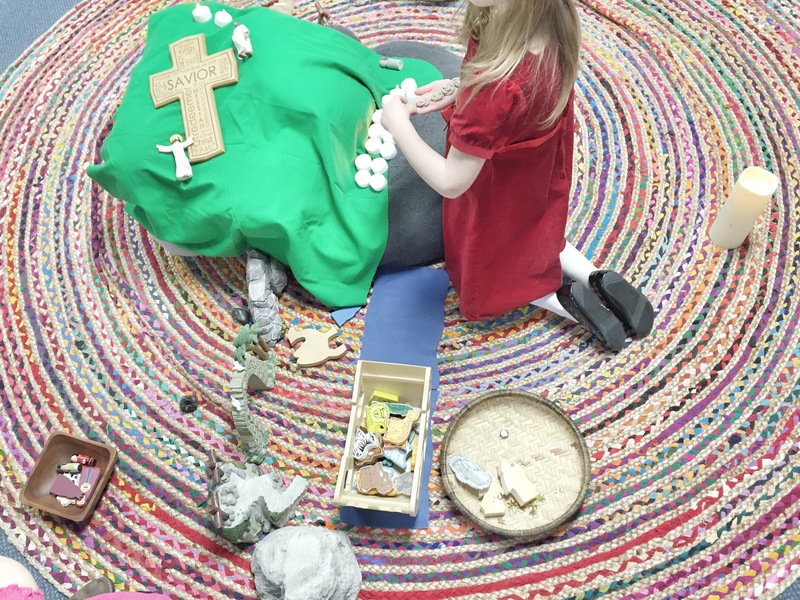 How do draw out children’s spirituality when your teach Bible stories for kids?